Whether you're taking the kids out or going yourself, snow tubing is a great winter activity! And, you can partake in snow tubing at a variety of places in the Lake George area. It's fun, affordable, and a fantastic way to make the most of this snowy time of year. Below are the most popular sites to go snow tubing in the local area. West Mountain's Tubing Park features multiple (both short and long) snow tubing trails. All tubes are provided by West Mountain and can be hooked together for group slides, which is tons of fun for family and friends. 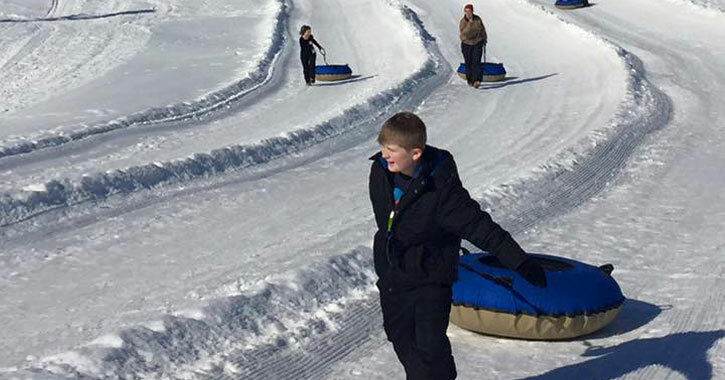 The tubing park is also available for birthday parties and corporate outings. Tubby Tubes isn't just for summer fun. With over 5 downhill snow tubing runs, thrilling snow coasters, and an 8-person family snow raft, Tubby Tubes takes tubing to the extreme. If you are looking for a good place for a party or group tubing, this is a great option. *Note Tubby Tubes is closed for winter activities for 2019. If you own snow tubes and would like to go snow tubing for free, then check out the Lake George Recreation Center. Featuring around four miles of cross-country ski trails, there is an exciting snow tubing hill at the site. Since the hill is fairly steep, you'll want to supervise the kids. Children should be old enough to ride down in their own tube and are usually only permitted if they are over the age of 2 or 3 (or at least 3 feet tall). Contact the tubing park ahead of time to make sure!